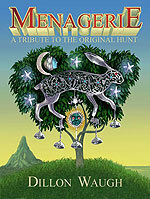 Menagerie began as a taster puzzle published in February 2004 on the web, by club member Dillon Waugh and was solved on 19 April 2004. It was free to enter and the winner received a framed signed print of the main picture in the hunt and received a free advanced copy of the of prints for the full hunt that followed. Dillon published the ful hunt, a much-anticipated tribute to Kit Williams' Masquerade, in July 2005. 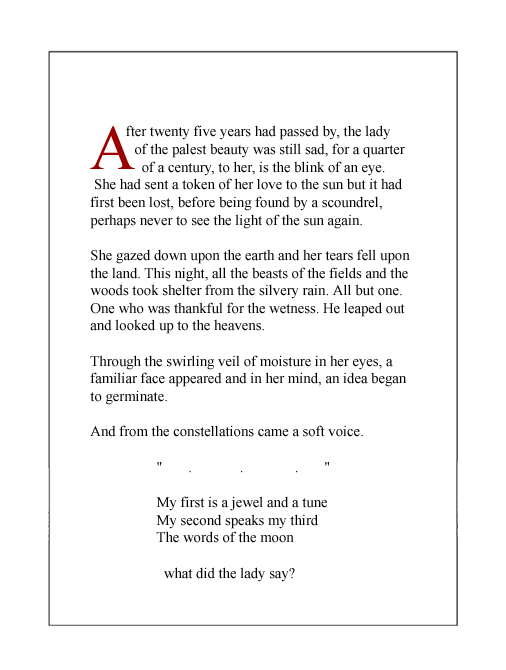 Menagerie takes the form of three illustrations and passages created by Dillon Waugh. 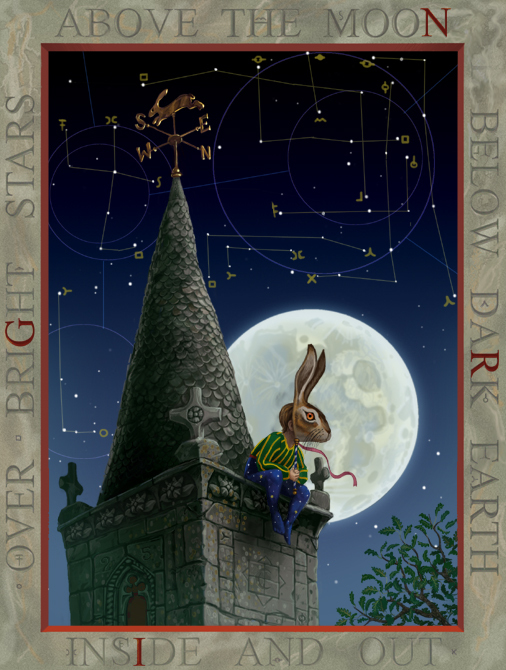 The hunt, illustrations, and text intentionally mimic Kit Williams' style and the prize - a jewelled silver hare, is a facsimile of the original golden hare from Masquerade. The entire hunt was free to download from Dillon's website, but all participent were invited to make a voluntary contribution to Dillon, in return for which further clues would be released a week or two earlier than to the general public. Club member Paul Harkin announced he had retrieved a map in July 2008, from the Three Shires Stones, at the border of Gloucestershire, Somerset and Wiltshire. The map leads to the final location of the hare. Believe it or not, this is the "taster" for the main hunt. But you must be quick as not only will you win a framed signed high quality copy of the fantasic picture depicted above but you will also get a small head start on the main event. You can discuss Menagerie on the Q4T forum.